Desperate men make desperate decisions, and more often than not they end up leading to more trouble. 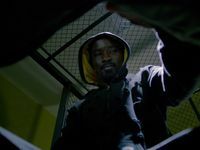 As Luke Cage works overtime to right Harlem's wrongs, Cornell Stokes and his men desperately work to reclaim his power. 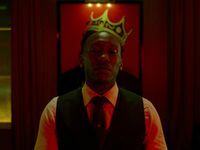 Cottonmouth, whose mind is clearly affected by Cage's actions, makes a major mistake that could come back to haunt the crime boss. His mistake is the way he chooses to clean up another poor decision-maker's mess - Detective Scarfe (Frank Whaley) - and the repercussions, and revelations in the wake of their confrontation. Cage has evolved throughout the series, and there's no better demonstration of this than in "Suckas Need Bodyguards". It mainly revolves around his relationship with Claire Temple. 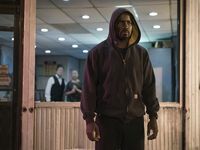 Rosario Dawson's Temple is the common link between the three Netflix series, and her heavy participation in this episode is another step towards The Defenders. While both Cottonmouth and Cage dominate the action, another major story unfolds throughout. Mariah Dillard, a politician, has spent much of the series on the campaign trail. A sit-down interview is all it took for Mariah to go from the confident, assured campaigner to having the rug swept out from under her. Alfred Woodard communicates Mariah's shock and inner turmoil superbly: you feel every emotion Mariah feels in those final minutes. 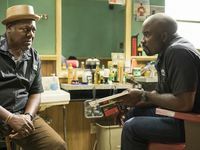 Moments like this, as well as Misty Knight's (Simone Missick) rollercoaster, make Luke Cage one of the best series on television, let alone Marvel's Netflix series.